Hanoi (VNA) – Prime Minister Nguyen Xuan Phuc and his spouse chaired a ceremony to mark the 50th founding anniversary of the Association of Southeast Asian Nations (ASEAN) and 22 years of Vietnam’s accession to the bloc in Hanoi on August 8. The PM highlighted the achievements that ASEAN has gained over the past a half century to become a strong and united community with rules-based operation and comprehensive and extensive connectivity across the fields, contributing to the maintenance of peace, stability, cooperation and development in the region. ASEAN has an increasing role and position in the region and beyond, he said, adding that the association is also playing a crucial role in the evolving regional architecture. The bloc should reinforce solidarity and unity, promote internal strength to increase its connectivity and build a rules-based community with the widespread participation of people to bring them with pragmatic benefits, he recommended. With a population of over 630 million and the total gross domestic product (GDP) of nearly 2.6 trillion USD per year, ranking sixth in the world, along with a peaceful and stable environment, ASEAN is a spotlight of economic cooperation in the Asian-Pacific region and the world at large. “The achievements that ASEAN has gained over the past 50 years are very huge, creating a firm foundation for the development of the ASEAN Community and the realisation of the ASEAN Community Vision 2025,” he said. 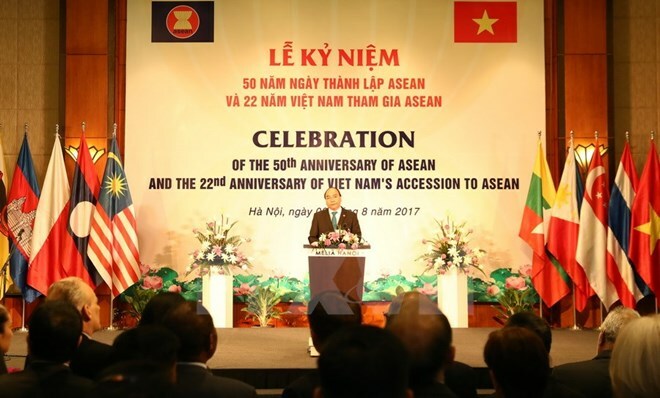 He affirmed that Vietnam always considers ASEAN a prioritized pillar in its foreign policy and vows to continue accompanying the bloc’s member states to build the ASEAN Community of unity, peace, stability and strength and successfully accomplish the ASEAN Vision 2025 and blueprints, contributing to maintaining peace and stability, and stepping up cooperation and development in the region. On the occasion, he also thanked the bloc’s partners, international organizations and friends for their cooperation and support for the ASEAN member states over the past time, and wished that the Ambassadors and officials of the international organizations would continue acting as an effective bridge for their countries and organizations and Vietnam and ASEAN. Addressing the ceremony, Philippine Ambassador to Vietnam Noel Servigon stressed that one of ASEAN’s big achievements over the past five decades is developing into a strong bloc, which has been acknowledged and respected globally, from a five-member organization. He highly valued Vietnam’s organization of numerous activities to mark ASEAN’s 50th founding anniversary in many localities and informed participants of the successful outcomes of the 50th ASEAN Foreign Ministers’ Meeting and related meetings.